We are nearly four months into the 72nd Session of the General Assembly. And I believe we can say we have achieved a lot in this time. We have adopted over 250 resolutions. We have taken concrete action on proposals to reform the United Nations. We have launched new initiatives. One of my own contributions was the start of a series of Morning Dialogues, which bring permanent representatives together in a new, interactive format. We have adopted a new regular budget for 2018-2019 period. We have seen new co-facilitators begin their work. And I am glad to say that nearly all of them are part of gender-balanced teams. These are only some of the many concrete results we have seen so far. But, we have more than eight months of work ahead of us, in the resumed part of the session. We need to see these eight months as an opportunity; as a chance to ensure that, when we get to September 2018, we will have even more achievements to point to. I will focus on some of them, in particular, today. First, I hope that one of our main achievements will be agreement on the world’s very first global compact on migration. Currently, we are in good shape. A lot of hard work went into the first part of the 72nd Session. The report of the co-facilitators, released in December, was a testament to this work. This report, and the stock-taking meeting in Puerto Vallarta, allowed us to end 2017 on a positive, and constructive, note. We do need to be realistic, though. There have been areas of contention and disagreement along the way. But, from what I have seen, there is more that we agree on, than we disagree on. Negotiations on the Compact will begin on 20th February. They will be a test – for all of us. It doesn’t matter what position we have on migration, or on the Global Compact itself. We will all have to compromise. We will all have to mobilise support at home. We will all have to move a bit closer to the middle. Because, we simply must have an agreement in July. This is the promise we made to ourselves – and to people around the world. We cannot go back on it. We also have a responsibility to keep up the momentum in the period between a July agreement, and the planned adoption of the Compact in December, in Morocco. Part of this should entail education and outreach efforts. Because, yes, the Compact will be negotiated in a room like this. But it is the people not in these rooms – in cities, villages, and suburbs all over the world – who will implement it, and be affected by it. We need them to know about it. We need them to understand it. We need them to accept and support it. A second achievement, which I hope we can point to in September, relates to Sustaining Peace. As you know, I will be convening a high-level meeting on peacebuilding and sustaining peace on the 24th and 25th of April. I want to focus, today, on our aims and objectives. And I will mention four of them in particular. First is conflict prevention. We need a stronger focus on peace when it still exists. We should be acting faster, and sooner, when there is a peace to keep – rather than scrambling for solutions once it has been lost. We already have many of the tools we need to do this. We must, however, start to use them differently. The April meeting will be part of this ongoing process. Second, partnerships. The high-level meeting should be a greenhouse for partnerships. We need to make existing partnerships more active and efficient. And we need to create new ones. Third, financing. Currently, the UN’s peacebuilding and sustaining peace activities are chronically underfunded. By adopting the 2016 Sustaining Peace resolutions, we committed to addressing this issue. The Secretary-General’s report, due to be released next month, is likely to contain concrete proposals. We need to give them serious consideration. And we cannot waste this opportunity. And, fourth, integration. Because, we need to join the dots. Sustaining Peace is not a task for one office, or one team at the United Nations. Instead, it must be mainstreamed. From promoting human rights, to advancing Sustainable Development – everything the United Nations does must be seen through a lens of peace. And we must assess how the existing frameworks and agendas can be mobilised in this way. And, I also want to stress one more important aspect, when it comes to Sustaining Peace; namely, the participation of women and youth. We have seen that it is mostly men who negotiate and sign peace deals. However, this is not sustainable. And it does not reflect reality on the ground. Because, women and young people play a major role in building and preserving peace. Their experiences and ideas must be seen and listened to. The high-level meeting will provide a new platform for this to happen. Even at this stage, one thing is for certain: this cannot be “just another” UN event. We need to engage more. We need to talk more. We need to learn new information, and hear stories from the ground. And, importantly, we need to take this opportunity to publicly deliver a strong message: that Sustaining Peace can, and will, be a reality for people all over the world. Now, turning to development. A third area in which we must see progress is the implementation of the Sustainable Development Goals. As part of my own contribution to this, I will be convening three major events in the resumed part of the session. The first will focus on water. The use and management of water can mean the difference between conflict and peace; between poverty and growth. Those without easy access to safe water can suffer both disease and indignity. On 22nd of March, I will convene a high-level launch of the International Decade for Action, “Water for Sustainable Development”. This will give us an opportunity to rally the international community around water-related goals and targets. The event must include a variety of different stakeholders. I am confident that the discussions we will have, and my summary of this event, will contribute to the review of SDG 6 during this summer’s high-level political forum. The second event will take the form of a youth dialogue. This will not be a dialogue about young people. Those kinds of events have been held in the past, with little impact. Rather, it shall be a dialogue with young people. It must focus on their experiences, their challenges and, importantly, their ideas. To facilitate this, our plans include interactive chats, an open mic session, and virtual reality zones. A wide range of topics will be covered – from education, employment and opportunities, to prevention of violent extremism and radicalisation. The youth dialogue will take place on 30 May. I will soon be launching an event webpage with relevant information. We have already carried out the first of a series of live Twitter chats. And we will continue outreach on social media, and through various meetings and lectures. I want to strongly encourage you all of you to invite your youth delegates and representatives to the event. While will take place, I repeat, on 30th of May. An event on financing will be the third contribution from my Office to the ongoing implementation of the Sustainable Development Goals. There are no two ways about it: if we don’t do something soon, we will not have the resources to achieve the Sustainable Development Goals by 2030. This event, which is planned for 11th of June, should act as a platform for stronger public-private partnerships. I aim to use my convening power to bring many different stakeholders around the same table, including the World Bank, OECD, regional development banks, and businesses. We must explore what the United Nations can do to better align itself with the rapidly-changing world of international finance, and support the 2030 Agenda and the Addis Ababa Action Agenda. You might have noticed that all of these events take place before the High-Level Political Forum, in July. This is for a reason. The HLPF will, this year, address water, energy, cities, life on land, and sustainable consumption and production patterns. And, my aim is for the discussions and outcomes of all three events to feed into this critical review process. Here, I want to stress the importance for the respect for human rights in everything we do at the United Nations. If we neglect human rights, we will not be able to point to any achievements in September. Because there can be neither peace nor development without respect for dignity and fundamental rights. That is why human rights must be mainstreamed throughout all of our activities – from peacebuilding and Sustaining Peace, to SDG implementation and migration. I also intend to make further trips to Geneva, which will focus on strengthening links with human rights activities in New York. And we need to look more closely at how we can harness the expertise and experience in Geneva for our efforts related to Sustaining Peace – both here, in New York, and in the field. Next, when it comes to September 2018, we need to be able to say that the United Nations kept up with a changing world. And this can only happen if we help this Organisation to evolve – and to reform. The ongoing reform of the United Nations Security Council is probably the most publicised of these efforts. As you know, the first round of intergovernmental negotiations for this session will take place at the end of January. As a transparency initiative, Co-Chairs will soon announce a full, advance schedule. I don’t know what the outcome of these negotiations will be. I do, however, know this: we cannot move forward without real dialogue. Repeating the same arguments, and refusing to budge from our national positions, will get us nowhere. Meanwhile, we are in the process of repositioning the UN’s development system to deliver on the 2030 Agenda. In the words of the Secretary-General, this presents us with a “unique opportunity and a shared responsibility”. After the Secretary-General’s concrete proposals are considered during the ECOSOC Operational Activities – in February and March -this Assembly will have an important role to play. Your deliberations will also be linked to the alignment process, as well as to the ongoing ECOSOC review. We tackled the issue of management reform during the first part of the 72nd Session. 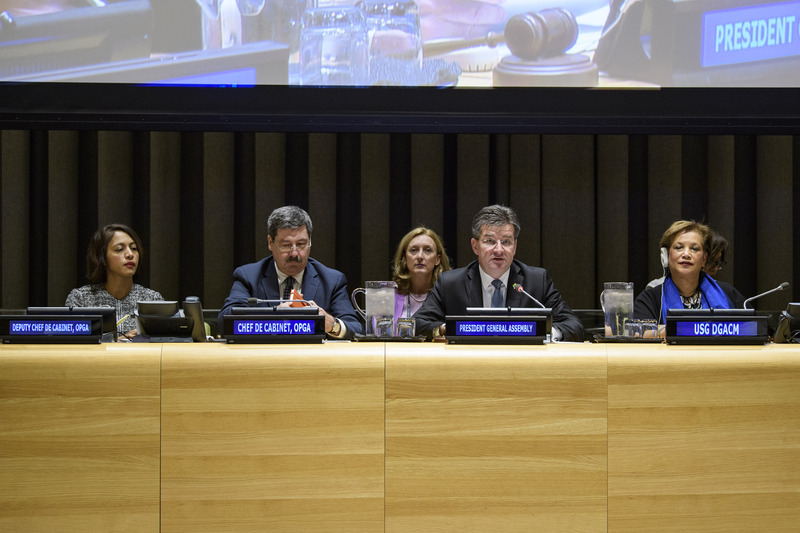 The General Assembly voiced its support for the Secretary-General’s efforts to make the United Nations more effective, accountable and efficient. However, there is more work to do. Further discussions will need to be had once the Secretary-General submits his comprehensive report. Also, work must continue on the reform of the United Nations’ peace and security pillar once the Secretary-General submits his second report. Let me say a few words about the mandates of the General Assembly now. Because, for the United Nations to adapt to the world around it, reforms, alone, will not be enough. We also need to focus on the work – and the mandates – we have before us. That is why the process to revitalise the work of the General Assembly demands our continued attention. This is the most representative body in the world – and one in which we all have a stake. I am counting, therefore, on your constructive engagement. Staying on the topic of this Assembly’s work, I intend to continue my interaction with the General Committee. In 2017, we held three formal meetings, all of them dealing with the agenda of the 72nd session. And, there is a lot on this Assembly’s agenda. We have many mandated processes ahead of us. In the resumed part of the session, we will start planning for the Diplomatic Conference on BBNJ. Which, as all of you know, is the legally binding instrument on marine biological diversity of areas beyond national jurisdictions. Preparations for the first ever High-Level Meeting on Ending Tuberculosis will begin. And we will also convene the first comprehensive review of the prevention and control of non-communicable diseases since we adopted the SDGs in 2015. In June, the biennial review of the Global Counter Terrorism Strategy will take place. We will also organise the first informal interactive hearings with indigenous people, on the margins of the Permanent Forum on Indigenous Issues, in April. And, importantly, for the first time, we will be conducting dialogues with the candidates for the position of President of the General Assembly for the 73rd Session. So, dear colleagues, as you can see, we have a heavy schedule for 2018. And this is not even a full overview. A more comprehensive list of existing mandates is available in the room for you. Although we will carry out these mandates in full, we must also have a longer-term view. New and different international challenges will continue to emerge. And the United Nations must be able to respond to them. But the answer cannot only be to create more and more mandates. Because we simply do not have the capacity to do this. And we run the risk of prioritising quantity over quality, which could hinder – rather than help – the reputation and the work of the United Nations. I hope that we can look at this issue in more detail over the coming months. My aim today was to give you information on my priorities for 2018. But, before I conclude, I want to say something else: We don’t have to look very far to see that multilateralism is under threat. And I’m not talking about budgets, or resolutions, or withdrawals. This is a wider – and more dangerous – trend. Because, the very purpose of the United Nations is being questioned. Not by one actor – but by many. And this has meant that truths, accepted for decades, are now up for debate. For example, that we are stronger together, than apart. That all voices should be heard – not just those belonging to the most powerful. And that a compromise or agreement for all is better than a win for one, or a few. We all have a responsibility to push back, against this trend. I am committed to doing my part. And I hope all of you, sitting here today, will join me. And I hope that we can toast to our success in September! Thank you for your time– and good luck for the rest of the session!